Mens casual Rue Du Rhone stainless steel matt black chronograph watch with a round case engraving 'RUE DU RHONE'. Has a black dial with red Arabic numerals and red hands. Features a seconds subdial, 12 hour subdial, 30 minutes subdial and a large date window. 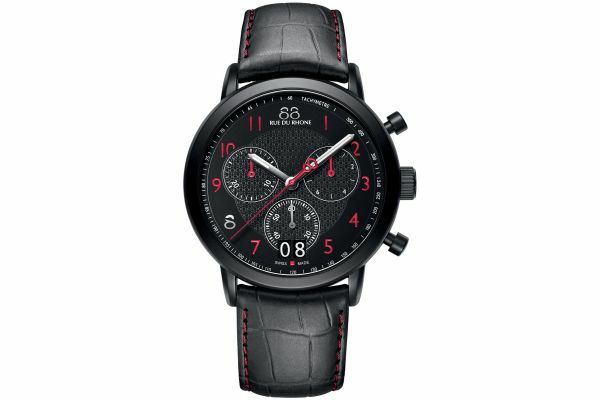 Has a black leather strap with stunning red stitching and a matt black buckle. Powered by a quartz movement and comes with the Rue Du Rhone 2 year guarantee. 88 Rue Du Rhone 45mm Quartz Chronograph 87WA130032. For us to size your new 88 Rue Du Rhone 45mm Quartz Chronograph watch as accurately as possible, please take a look at our downloadable Watch Sizing Guide.